HazCom labels and SDSs are confusing – until now. Two OSHA industrial hygienists explain what is happening right now with the Hazard Communication Standard. Hear about HCS 2012 changes in chemical labeling and Safety Data Sheets. OSHA’s Lana Nieves and Sven Rundman of The Directorate of Enforcement Programs discuss major and minor details that every safety manager and company owner will want to know. In this podcast, we focus on pictograms, labeling refillable containers, secondary and bulk shipping containers to name just a few topics. This podcast is based on The SCHC OSHA Alliance webcast on “Hazard Communication 2012” from September, 2015. Sven Rundman: On the employer’s part, that if they suspect there’s a newer version of a Safety Data Sheet, they should be contacting the manufacturer to obtain the most recent version. Dan Clark: OSHA’s Hazard Communication Standard is here. Still, people have many questions about chemical labels and Safety Data Sheets. Two OSHA experts will help us with the facts. Hello, I’m Dan Clark with Safety Experts Talk. Today we’re hearing from OSHA industrial hygienists Lana Nieves and Sven Rundman. Dan: Lana and Sven are from OSHA’s Directorate of Enforcement Programs, Office of Health Enforcement. Sven: We’re going to be talking about some differences or some information dealing with the June 1st, the 2015 enforcement guidance. Dan: This is not a typical Safety Experts Talk. I didn’t interview them but these experts are still talking. Our podcast with them is sourced from the SCHC OSHA Alliance webcast on Hazard Communication from early Sept., 2015. That public webcast was so good, I just had to share parts of it. It was an hour long, so just the information about HazCom labels and Safety Data Sheets is included in this podcast. To hear the whole SCHC OSHA Alliance webcast, go to the link in the transcript of this podcast. Now, on to chemicals. Sven Rundman starts with issues that came up in late 2014. Sven: Back in the fall of last year, OSHA began getting inquiries that manufacturers/importers could not receive information from their upstream suppliers to help develop their 2012 Safety Data Sheets or labels. Earlier this year, OSHA issued February 9th an interim enforcement guidance which proposed information as far as how a manufacturer/importer can still be in compliance with the rule if they have not received information from upstream suppliers. After that February 9th memorandum was issued, follow-up questions were received by OSHA regarding the existing stock that manufacturers and importers and distributors already had that were already labeled 1994. Both those memorandums, that information was ultimately placed into the OSHA instruction to provide that further guidance for downstream users. Dan: Sven explains the enforcement guidance details. Sven: So what this enforcement guidance allows is that OSHA is using enforcement discretion in limited instances where the manufacturer or the importer has not received any classification or safety data information from upstream suppliers to develop their own 2012 compliant SDSs and labels. The Standard order requires that the time period for SDSs is three months from receiving hazard information and for labels six months of that date after the SDS. So OSHA is allowing accommodation for certain instances. It applies in those manufacturers/importers that have excised reasonable diligence and good faith efforts to obtain the hazard classification information. But again, it’s for circumstances that it’s beyond the control of the manufacture/importer that have not received the information. Also, the manufacturer/importer who may have ’94 compliant labels and MSDSs, it still must have reasonable diligence, good faith efforts to be in compliance. Sven: The compliance officers, when they’re out in the field—if they have an inspection at your facility—they’re going to consider whether the manufacturer/importer developed and documented the process to gather that necessary information to develop their own Safety Data Sheets and 2012 labels. Did they e-mail them? Did they call the upstream suppliers to get the information? Did they make any efforts to find information from other sources? If the upstream supplier would not provide it, maybe there are other sources available internationally that may be of assistance. From that, they had a written account of the dialogue. When they contacted upstream suppliers they needed to make sure they include, you know, dated copies of the material to show that good faith efforts. The course of action: the manufacturer importer must have some sort of clear timeline to indicate when they will be developing the update of their SDSs and labels based on information that they’re getting from the upstream suppliers. Dan: He also explained the details of warehoused, old inventory. Sven: So for manufacturers and importers, if you’re a distributor that’s considering repackaging, blending or mixing, you fall under this category as well. For existing stock that’s packaged for shipment—meaning, for instance, it’s boxed, palletized, shrink-wrapped—and it was done prior to June 1st, those containers can be shipped downstream provided containers are properly labeled with a 1994 compliant label on there. There is no requirement to label it with a 2012 label. However, chemicals packaged for shipment after June 1 of 2015 must be labeled with a 2012 compliant label. If those packages for shipment prior to June 1st, once the manufacturer/importer has developed a compliant label and SDS, they must supply that for each and every individual container shipped as well as provide the appropriate Safety Data Sheet. By all means after June 1st, 2017, all containers that are being shipped by the manufacturer/importer must be HazCom 2012 compliant-labeled. Dan: How do the rules differ for distributors, if at all? Sven: For distributors, they already have—per the Standard—permitted to ship chemicals ’94 labeled until December 1st, 2015. Well, OSHA’s mindful that, you know, there are, may be potential delays on the part of the manufacturer/importer providing that information because they are not in compliant, as they have circumstances beyond their control, have not received the information. Where this distributor has both containers that are 1994 labeled, then they’re allowed to ship those containers downstream with ’94 labels on there. Again the expectation is that they will provide reasonable diligence, good faith and have discussions with their upstream suppliers, the manufacturers/importers to determine when they will be provided the appropriate information. For distributors, existing stock that’s packaged for shipment that are compliant and 1994 compliant-labeled, before December 1st, they may continue shipping those containers downstream. Again, there’s no requirement to relabel those packaged-for-shipment containers. But once they start receiving compliant 2012 labels and SDSs, they must also now provide that, those labels, for each and every container shipped as well as the appropriate Safety Data Sheet. Example of required elements on HazCom labels. For distributors, all containers that are shipped after December 1st must be HazCom compliant-labeled, unless they can still demonstrate reasonable diligence, good faith efforts that they have not received information from upstream suppliers, the manufacturers or importers. Dan: Remember, Sven is referring to December 1st 2015. Next, our two OSHA experts answer questions on HazCom labels. What are the HazCom label requirements for refillable containers? Sven: Well, for those that are refillable, it may be considered secondary container labeling and we could use workplace labeling for that. But if the contents of the refillable container came from a larger one and is being used by the individual who transported for their immediate use, then that portable container does not need to be it labeled. And that’s according to paragraph (f)(8) of the Standard. Dan: Ms. Nieves answered a question about what info has to be included on workplace labels. 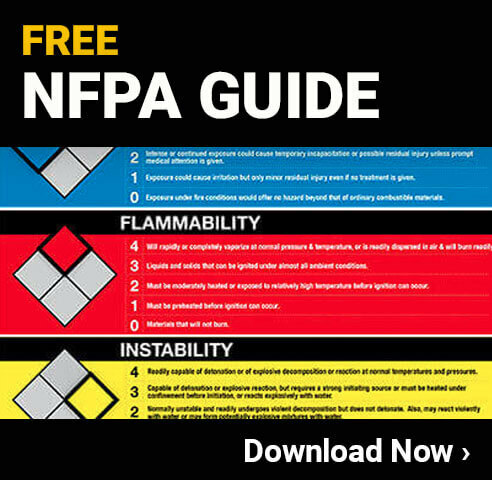 Some companies use NFPA labeling but have found that recent Safety Data Sheets don’t provide NFPA information. Lana: Workplace labelings pretty much follow (f)(1) or else they use a product identifier, words, pictures or symbols or a combination of those, unless they fall under (f)(7) or (f)(8)—which is placards under (f)(8) and then (f)(7) is immediate containers. However, we don’t have jurisdiction over NFPA, so we can’t really enforce that on our SDSs. That would be out of our jurisdiction. Dan: If the original container has a pictogram on it, does the same pictogram need to be on the secondary container label? Sven: Yes. But that pictogram on a secondary container does not need to have a red border. It can be a black border for the pictogram. Dan: Can you take a picture of the label on the original container, print it, and use that as a label for secondary containers? Lana: Yes. As long as they can’t be defaced or tape fall off or come off. And, since it’s a secondary container, I would consider it an immediate container if they were going to use it immediately. As long as the original container is properly labeled. Dan: Is a HazCom label required for bulk shipping containers? Sven: Under the Hazard Communication Standard, when we’re speaking of bulk containers, I’m thinking rail cars, tank cars, and things of this nature. The label requirements are dependent on “Is it a stationary? Is it an in-house transport type container?” Depending on where it’s at in the shipping “mode,” I guess you could say, it could be, actually, DOT may have jurisdiction versus Hazard Communication. But I would refer to the compliance directives, specific on pages 48 and 49 of the compliance directive, which talks about labeling those types of containers. Dan: Will using HMIS labels for secondary containers after the June 1st, 2016, deadline still be in compliance with the Standard? Lana: If it’s used as supplemental information, then it can be in compliance as long as it has the HCS 2012 information. Dan: Sven answered the question about workplace labeling requirements for secondary containers, such as spray bottles. Also about the Hazard Communication Standard covering consumer items in the workplace. Sven: Just as from 1994, if a consumer product is used in the manner that one would normally use it in our home, then that product is not covered. And more likely at that point in time, those types of spray bottles that you may buy at a hardware store or a grocery store and things of this nature are going to be labeled in compliance with the Consumer Product Safety Commission. So, there’d be no responsibility to providing the labeling of that information. However, if it’s being used in a fashion above and beyond a normal consumer and you transfer that to a secondary container, then we would look at having workplace labeling on that secondary container, as well as making sure workers are properly trained and the Safety Data Sheets are available. Lana: Employers must maintain the most recent version of an SDS or MSDS. We don’t really require what you call it, as long as it’s training and they can find it and locate it and they know what’s inside. That’s all we require. Dan: How do you handle the situation when a manufacturer has not issued the appropriate Safety Data Sheet? Sven: Well, you know, on the employer’s part, that if they suspect there’s a newer version of a Safety Data Sheet, they should be contacting the manufacturer to obtain the most recent version. If there’s a little bit of reluctance on the part of the manufacturer or employer to provide any new or appropriate SDS, if you believe there is one, the employer does have the right to file a complaint or call the OSHA area offices locally to see about getting some assistance on helping them obtain the SDS. Dan: Are hard copies of SDSs still required to be kept in chemical storage areas or are online versions acceptable? Dan: The next answer is about the employer’s responsibilities if a manufacturer is not updating their Material Safety Data Sheets to Safety Data Sheets. Dan: The pictogram with the fish and tree on it is not being enforced by OSHA. But will an OSHA inspector make a call to the EPA or similar agency? Dan: Next, Lana Nieves reviews the important dates of the OSHA Hazard Communication Standard. Lana: We’ll go briefly over the effective dates since we know that this is an important topic. December 1st, 2013, employers had to train employees on the new label elements and SDSs in preparation for finalizing of the HCS 2012 new requirements. June 1st, 2015 required chemical manufacturers and importers to comply with the final rule. And on December 1st, 2015, distributors must ship only HCS 2012 compliant labels. Remember, distributors that repackage or label or create SDSs are manufacturers and must comply with the June 1st date. Now, during the transition period between all these dates, the manufacturers and importers must comply with either the 1994, the 2012 or both. Dan: Ms. Nieves also explains a future date. Lana: What’s coming up? The June 1st, 2016 date. This date requires three main things to be done. Update the alternative workplace labeling. Update the Hazard Communication program, if needed. And lastly, provide additional employee training for any newly identified physical and health hazard. Dan: What about top violations and citations? Lana gives the tally since the new HazCom Standard has been implemented. Lana: The top six cited violations since December 2013 until September 2015. The number one violation still remains the written program. The top six violations involve all the main categories of the Hazard Communication Standard: the program, training, SDS and labeling. Dan: Sven Rundman returns with offers of free HazCom Standard content for a safety manager or company owner. Sven: I hope by now everybody’s had a chance to go to the OSHA Safety & Health Topics page on Hazard Communication where there they can download things such as QuickCards, Fact Sheets and OSHA Briefs dealing with such topics as Safety Data Sheets, labels, pictograms and, for those interested, the comparison of the National Fire Protection Association’s 704 rule Standard and HazCom 2012 and how they relate with each other. Another good guide that we certainly hope everyone has a chance to use to help develop their program is the Small Entity Compliance Guide. For a physical copy of that, people can call the publications number and they can order an actual hard copy, if they like, or download it as a PDF. Dan: That number is 1-800-321-6742, 1-800-321-OSHA. Sven: The Small Entity Compliance Guide provides that information to employers to help them develop their Hazard Communication program. It does not address how to classify a chemical but it certainly focuses on the parts of Standards that apply to employers. Things, again, such as Safety Data Sheets, labeling and what’s included in your written Hazard Communication program. Included in this document is those steps to compliance. It’s a step by step approach and in this compliance guide it also includes a sample written Hazard Communication program if you have not yet provided one or you wanted to know what changes you may need to look at in your program to make sure it’s compliant with 2012. There’s also a quick guide to Hazard Communication training and additionally fact sheets have been issued that summarizes these steps to compliance. Dan: Thanks to OSHA HazCom experts Lana Nieves and Sven Rundman for the information and to The SCHC OSHA Alliance for sharing their webcast audio with Safety Experts Talk. We thank you for joining us. I’m Dan Clark.